Vegetation invading your dock or favorite fishing spot? If your lake does not qualify for a grass carp permit, or you prefer not to use chemicals for vegetation management, we have an alternative. Our partner in dredging operations has equipment to remove annoying plants as easily as mowing your lawn. 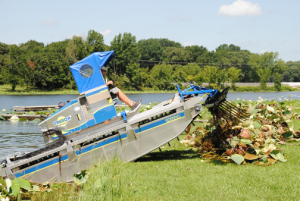 The amphibious unit utilizes weed cutter, weed rake, and grip bucket attachments to remove annoying plants, algae, or debris. 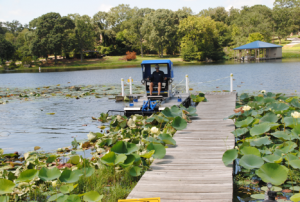 The firm also offers diver assisted suction services which work closely around swim areas and docks. Got fallen trees and unsightly debris blocking access to portions of the lake? The rake or bucket can remove material and stack it on shore for disposal. Equipment can be unloaded on the street or shoreline and driven into the pond with virtually no ground disturbance. Rake attachment stacks material on the shoreline for disposal. 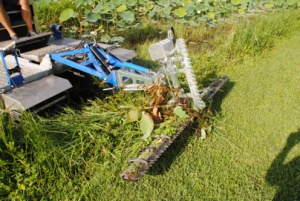 Innovative weed cutter removes plants below the water line. This entry was posted on Friday, June 8th, 2018 at 3:55 pm	and is filed under News & Updates, Product Review. You can follow any responses to this entry through the RSS 2.0 feed. Responses are currently closed, but you can trackback from your own site.